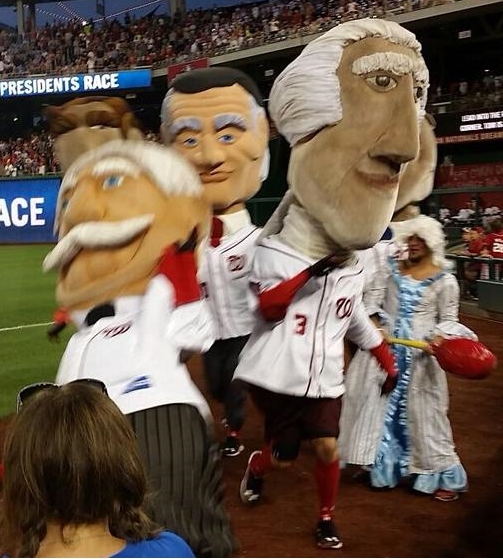 Video: Martha Washington knocks out five racing presidents with one swing, George wins | Let Teddy Win! 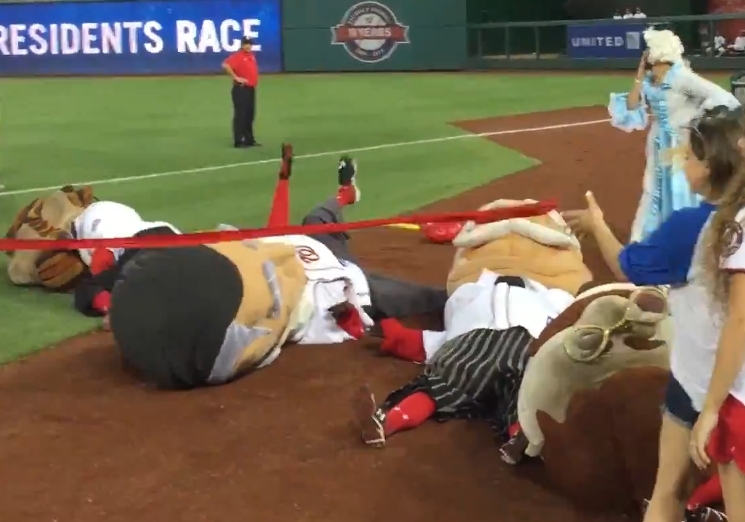 A bearded Martha Washington showed up for the Nats’ presidents race Monday night at Nationals Park and wielded a giant lollipop to knock out her husband’s five foes with one mighty blow. Celebrating both the 46th anniversary of the moon landing and National Lollipop Day (who knew? ), the first first “lady” handed out lollipops to fans in the front row of section 134A while the racing presidents engaged in a relatively slow-paced race around the warning track. As the presidents approached the finish line, George Washington shrewdly pulled back. That’s when “Martha” reached into the stands and grabbed a giant lollipop. William Howard Taft had a slight lead over Tom, Abe, Teddy, and Calvin, but the first first “lady” turned and swung the giant lollipop right into him, causing a presidential chain reaction, ensuring victory for the trailing founding father.